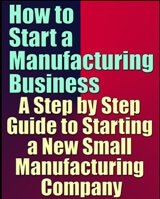 This guide will walk you step by step through all the essential phases of starting a successful manufacturing based business. To profit in a new manufacturing business, you need to consider the following questions: What business am I in? What products do I provide? Where is my market? Who will buy? Who is my competition? What is my sales strategy? What merchandising methods will I use? How much money is needed to operate my firm? How will I get the work done? What management controls are needed? How can they be carried out? And many more. This guide will help you answer all these questions and more. It takes time and energy and patience to draw up a satisfactory business plan. Use this Guide to get your ideas and the supporting facts down on paper. And, above all, make changes in your plan on these pages as that plan unfolds and you see the need for changes. Bear in mind that anything you leave out of the picture will create an additional cost, or drain on your money, when it unexpectedly crops up later on. If you leave out or ignore enough items, your business is headed for disaster. Keep in mind, too, that your final goal is to put your plan into action. More will be said about this step near the end of this Guide. Time was when an individual could start a business and prosper provided you were strong enough to work long hours and had the knack for selling for more than the raw materials or product cost. Small store, grist mills, livery stables, and blacksmith shops sprang up in many crossroad communities as Americans applied their energy and native intelligence to settling the continent. Today this native intelligence is still important. But by itself the common sense for which Americans are famous will not insure success in a business. Technology, the marketplace, and even people themselves have become more complicated than they were 100, or even 25, years ago. Common sense must be combined with new techniques in order to succeed in the space age. Just as one would not think of launching a manned space capsule without a flight plan, so one should not think of launching a new manufacturing business without a business plan. A business plan is an exciting tool that you can use to plot a "course" for your company. Such a plan is a logical progression from a commonsense starting point to a commonsense ending point. To build a business plan for your company, an owner-manager needs only to think and react as a manager to questions such as: What product is to be manufactured? How can it best be made? What will it cost me? Who will buy the product? What profit can I make? If you're like most business people, you're in business to make money and be your own boss. But, few business people would be able to say that those are the only reasons. The money that you will make from your business will seldom seem like enough for all the long hours, hard work, and responsibility that go along with being the boss. This is hardly the time for philosophy. If you're starting or expanding a business, you have enough to think about. But, whether or not you even think about it, the way you operate your business will reflect your "business philosophy." Consider this. An owner-manager inspects a production run and finds a minor defect. Even though in nine out of ten cases the user of the product would not notice the defect, the owner decides to scrap the entire run. What does this tell you? It shows that he (or she) gets an important reward from doing what is the right thing - in this case, providing a quality product. The purpose of this section is not to play down the importance of making a profit. Profits are important. They will keep your business going and attract additional capital into your business. But you should be aware that there are other rewards and responsibilities associated with having your own business. In your planning, you might give some thought to your responsibilities to employees, community, stockholders, customers, product, and profit. Jot these down. Later when you've lined-up your management team, discuss this subject with them. This type of group thinking will help everyone, including yourself, understand the basic purposes for each day's work. In making your business plan, the next question to consider is: What business an I really in? At first reading, this question may seem silly. "If there is one thing I know," you say to yourself, "it is what business I'm in." But hold on. Some owner-managers go broke and others waste their savings because they are confused about the business they are really in. The experience of an old line manufacturing company provides an example of dealing with the question: What business am I really in? In the early years of this century, the founder of the company had no trouble answering the question. As he put it, "I make and sell metal trash cans." This answer held true for his son until the mid-1950's when sales began to drop off. After much thought, the son decided he was in the container business. Based on this answer, the company dropped several of its lines of metal trash cans, modified other lines, and introduced new products, such as shipping cartons used by other manufacturers and Government agencies. Asking questions like: What does my product do for my customer? Why? Where? How? What doesn't it do? What should it do later but doesn't do now? can lead to the ultimate conclusion of what business you're in and possibly direct you to new lines of products or enterprises.